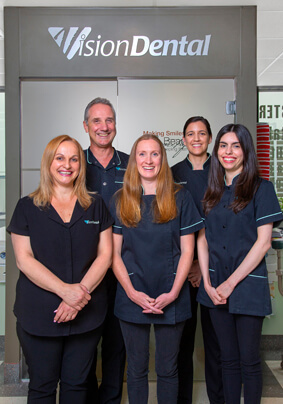 Our family and cosmetic dentistry office in Menai was originally founded by Dr Stephen Suster (Dentist) in 1990 and relocated to our current location in 1999. The name of our practice, Vision Dental, was inspired by our vision of providing dental care beyond typical services. As part of that vision, we consider the patient a partner in their approach to care. Vision Dental aims to provide quality care that surpasses your expectations. We do this by using the highest quality materials, latest proven techniques, in the most modern facility available, setting a world benchmark in quality patient care. Each of our rooms are equipped with a television mounted on the ceiling to help you take your mind off of things, or simply keep you entertained. You can even bring your own favourite movies to watch while you’re here. Informative brochures and slides are perfect for explaining processes of care and recovery. State-of-the-art equipment and technology mean that we’re able to provide earlier diagnostics and intervention for our patients. Through early intervention, we preserve maximum tooth structure and reduce the need for extensive treatments in the future. Whether you need gentle treatments for your child, or a complex smile makeover, your specific, individual concerns are always our top priority. Our friendly atmosphere is exactly what you’ve been looking for. Contact us today to schedule your first visit to our Menai clinic. Ask about our new patient complimentary evaluation.